I manage the bulk of the reviews and keep the others in line (sometimes). I am in charge of Read-it-if Reviews, Fiction in 50, Utopi-rama and Bruce’s Lucky Dip. I’m also the overseer of allocating this blog’s Gargie Awards and the Gargoyle-in-Charge of the Small Fry Safari Kid Lit Readers Challenge! Sometimes I do Spine Poetry. I am fond of crocheted hats. Welcome to the shelf – I hope you find something enlightening, inspirational, or at the very least, mildly amusing during your stay with us. I manage the Haiku and Lantern Reviews, and Spine Poetry on occasion. I am also responsible for compiling the odd Ode to an Author. I’m the most well-travelled of the shelf-denizens, having visited Japan, Germany, England, Wales, Ireland and Singapore. Here is a picture of me at the Cumberland Pencil Museum in the Lakes District. I highly recommend it for pencil fanciers of all persuasions. Click on the photo for more information about the pencil museum! I am fond of crocheting hats. The Maniacal Book Club take on the books that don’t fit under either Bruce or Martha’s review styles. Each member of the club presents their own unique take on the book under discussion. 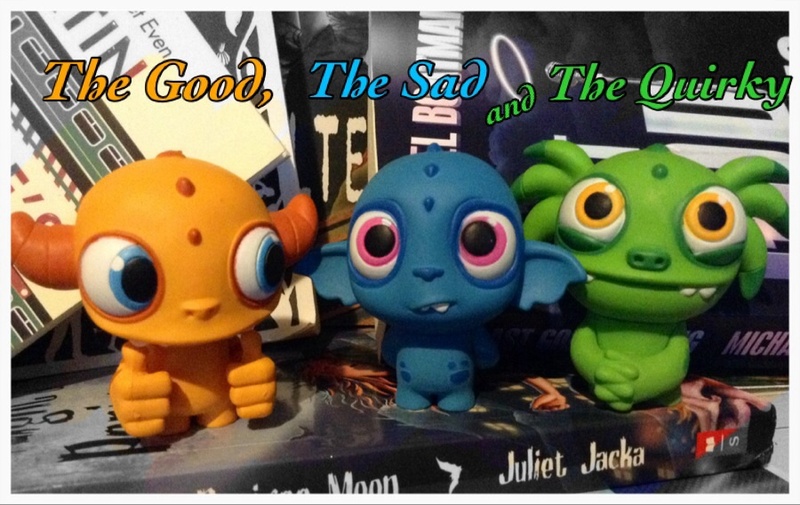 These three are the physical representations of Bruce’s bookish emotions. The Triplets appear when a book needs a bit of in-depth analysis. 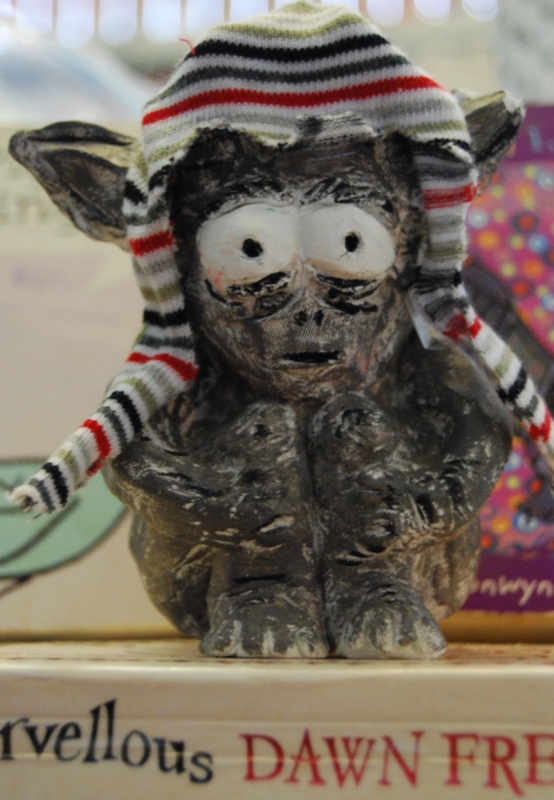 Hello, I found TheBookshelfGargoyle on Book Reviewer Yellow Pages. 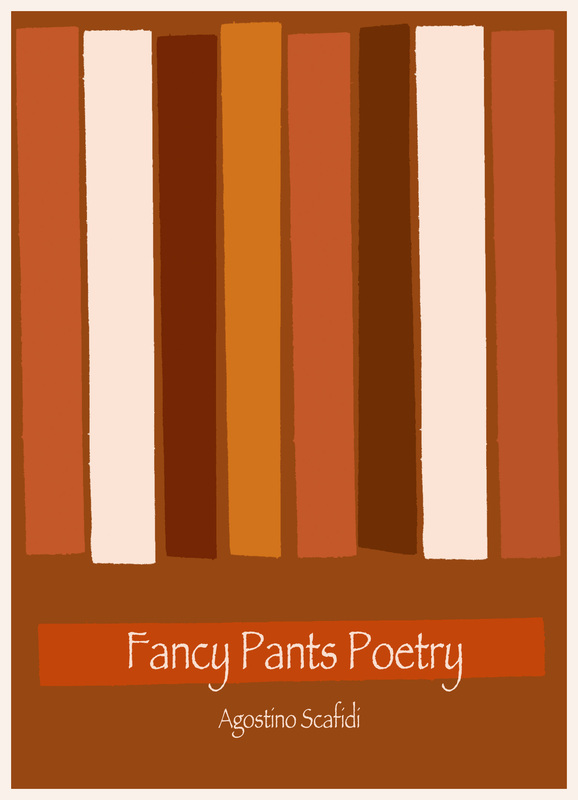 I’m promoting my eBook titled Fancy Pants Poetry. Would you consider reviewing it? The poetry you’ll meet in this collection will be biting, defensive, cynical and sarcastic. Dark humour is used to elaborate upon bleak life outlooks. At many times the spirit in these poems are rooted in antonymous rebellion. All that said, the reader will also encounter various instances synonymous with the proverbial “light at the end of tunnel”. Was wondering if you can give me a shot at a review. My book is middle grade fantasy. If you’re interested, please email at keats0810 at hotmail.com. My name is Wally Runnels. My short story, Mother’s Nature, was published on Kindle last month.